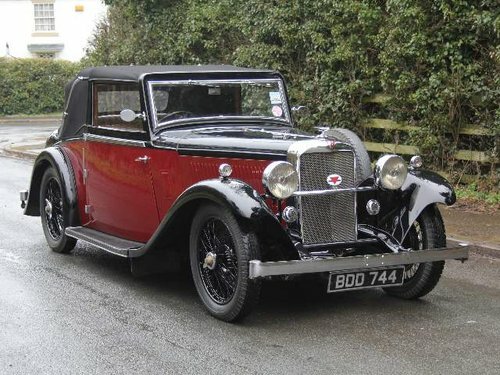 This beautiful Alvis Firebird DHC was supplied new by Haines and Strange of Cheltenham on the 3rd July 1936. BDD 744 boasts the beautiful Cross and Ellis DHC body and we are told only 25 of the 97 Firebird's manufactured with this body are said to survive. 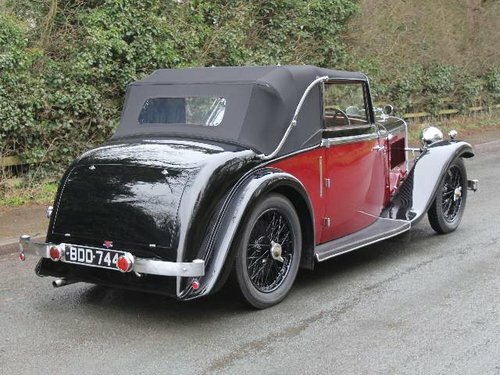 The first owner was Mr W Rust in Cheltenham and whilst we know little about the car during the 1940's, we do know the Alvis was owned by a Club member in Gloucestershire during 1963/1954. We also have an original brown 'buff' logbook that confirms that during the 1960's the Alvis changed hands several times between Surrey, South East London and Kent. Records confirm in 1984 the Firebird owned by Club member in Chatham, Kent who interestingly was the last entry in the old logbook suggesting the car has just the one owner for across three decades. In 1988 the Firebird was purchased by another Alvis owners club member who was based in Windsor. 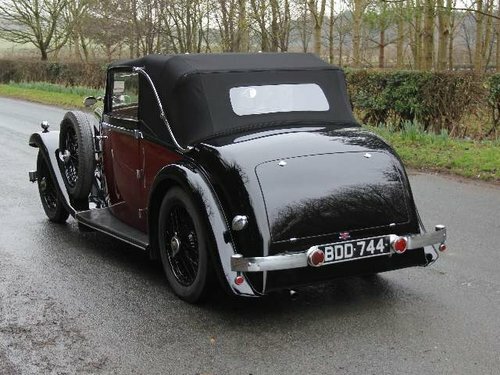 He kept the car for 23 years and enjoyed overseas open touring in the Alvis. Paperwork in the history file records various trips over to France and during his ownership extensive mechanical work was carried out. In 1999 an engine rebuild at cost of over £5,000 was carried out. This included re-lining the block, new Pistons and the block was acid treated and neutralised using caustic soda. Main bearing shells were checked and lined with white metal. Con rods were also checked, prepared and ready white metalled and the crank shaft re ground. The timing chain was replaced, water pump rebuilt and flywheel and clutch plate re faced and re conditioned as required. In the region of 5000 miles have been covered since this major engine work. 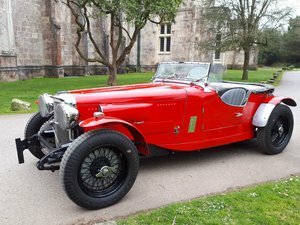 The Alvis was sold in 2011 and the new owner then spent £11,300 with Alvis specialists Red Triangle between 2012 and 2013. This included removing big end and main bearings and carrying out some engine rebuild work due to an engine fault. The starter motor was also re-conditioned as required due to failure and in the region of £3,000 alone was spent on a front suspension rebuild. Various electrical work was also carried during this re-conditioning work. In late 2017 a programme of cosmetic work began as whilst the car was in strong mechanical order, it had not been treated to any cosmetic work for many years. 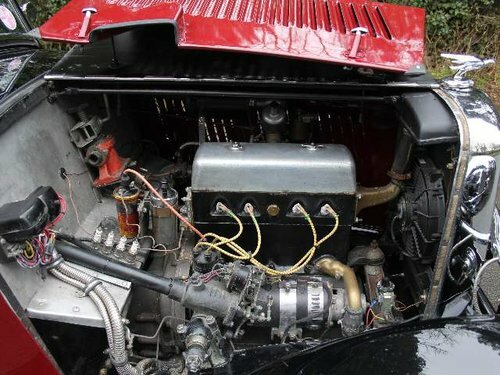 The body was stripped down to a rolling shell, paintwork was stripped right bac and the car treated to a complete full re paint in the cars original colours of Maroon over Black. The wheels were also stripped and re-painted and the car then built back up to present in stunning condition with exceptional gleaming paintwork. 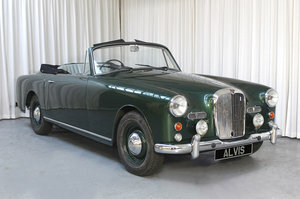 The Alvis was then treated to a brand new hood and interior woodwork was renovated. BDD 744 now is a truly exceptional car with a beautiful finish to it. 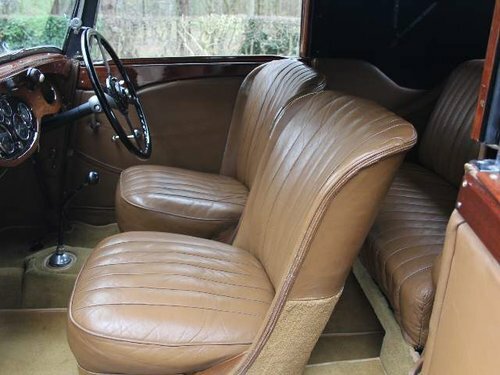 The interior still retains lots of patina with excellent quality nicely aged leather and the fresh woodwork and new expensive hood really complete the car. On the road the Alvis is impressive, as it was when thoroughly road tested by us on Harrogate ring road prior to coming to us. The engine performs very well indeed, the gearbox is very easy to use and the Firebird handles and brakes real well. 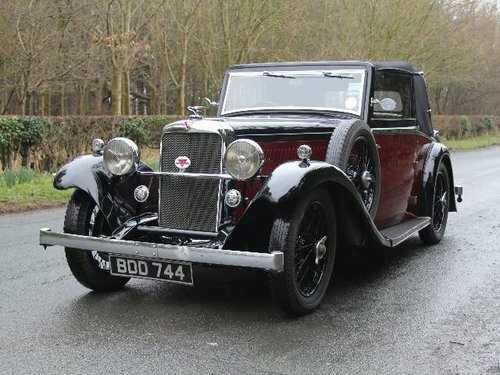 BDD 744 is an impressive pre war four seat tourer and it's now ready for shows, events and touring.